The age of 40 is like a legendary beast that you never expect to meet. Yet everyone who is lucky enough to reach that birthday must grapple with the inevitable existential questions that it brings, along with the ever-encroaching awareness of mortality—one’s own and everyone else’s. How can time feel so long and yet so fleeting? What kind of lives do we want to live, and how do we live them while we can? On Being 40(ish) was released February 5, 2019. 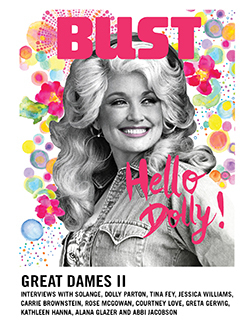 This article originally appeared in the March/April 2019 print edition of BUST Magazine. Subscribe today!